Game theory is an applied mathematics specialty (microeconomics, being more concrete) that studies the interaction between the participants of a “game”, understanding as game any kind of situation in which appears an interaction between different individuals or entities. Although its first application was (obviously) in economic issues, due to its versatility and ability to model different interactions, it has been applied in areas as diverse as biology or computer science. Crowdsourcing in particular, although collective intelligence in general, is a clear example of an area in which game theory can also serve to model the interactions between the different “agents”: the crowdsourcers and the crowdworkers. It is not the panacea. It has its limitations, but it is a good starting point. A finite number of “N” players. In the case of crowdsourcing you can identify the crowdsourcer and the crowdworker. A set of actions that can be taken and that will imply one incentive or another (or no incentive). In the case of the crowsourcer, he has 2 actions: promote the completion of the task or not. In the case of the crowdworker, he has 2 other actions: carry out the action or not. In certain crowdsourcing initiatives, the crowdsourcer will have two other actions available: accept or reject the contribution of the crowdworker. It is important to highlight that, in the case of crowdsourcing, there will be a different “game” for each interaction that occurs between the crowdsourcer and each crowdworker of the crowd. Therefore, a crowdsourcing initiative implies a multitude of games with disparate results, although groupable. This is a very basic scheme, since there are many elements that could be taken into account: the quality of the contribution, the amount of existing games that compose the crowdsourcing initiative, the known information of the other player (crowdsourcer or crowdworker), etc. On the other hand, each crowdsourcing initiative has its particularities, so the above explanation serves as a general scheme. For example. If we talk about crowdcasting, we talk about a game of zero-sum game, where each member of the crowd compete against the others: if other wins, you lose (and the rest too). The incentive no longer depends solely on your action, but on the action of the other games that make up the crowdsourcing initiative. Another example. In the case of some microtasking platforms, the crowdworkers have a profile and a performance history. In these cases, the crowdsourcer has information about the participants and knows if it is convenient to give a task to a person or not. 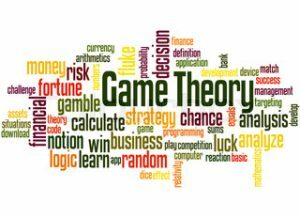 The relationship between crowdsourcing (and collective intelligence) and game theory is deeper, but this post serves as a first approximation.